I got Little Bitty all packed up last night and she left this morning after breakfast. I had such a hard time bonding with her for the first 2 weeks, then they told me she would be leaving and all of a sudden Tada! out popped the feelings! So basically to sum up my experience I spent 2 weeks feeling guilty for not loving the child, not even a little bit. The cute things she did left me completely cold, unimpressed, annoyed even, and always guilty. Whenever someone would comment on what a generous thing we were doing, how good of us to care for her as our own, all I could think of was the lack of emotion I felt for her and how much more she deserved. When I found out she was leaving I was relieved, not just because it had been so hard, but also because I hoped that her grandparents would love her like I couldn’t. She was napping when I got that phone call. When she woke up and I saw her, knowing that she’d be gone in another week, the emotion stirred within my heart for the first time. From that point everything was a lot easier for me. I started hugging her spontaneously, where before I’d had to remind myself to do it because babies need hugs. I poured into her every drip of sentiment I could squeeze out, hoping to make-up for the matter of fact, loveless way I’d cared for her in the previous weeks. Part of that was the doll. 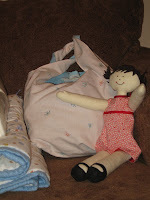 That’s how I love, I sew things, and the bag. The thought of packing her things in a plastic grocery sack made me feel a little bit sick inside so I made a fabric grocery sack instead. I honestly patterned it after a Target bag. I changed up the bottom a bit, made the handles a bit longer and the body of the bag a bit shorter. It is reversible, one side is a linen blend, pink with butterflies all over and the other is blue eyelet. Both fabrics came from my stash. I love stash sewing. 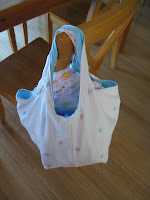 I’ll be making more of these bags, it was a good quick project. 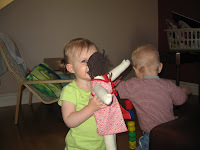 Anyway, after breakfast she played for a few minutes, kissed her dolly,(and I got a picture of it!) melting my heart at long last, I’m so thrilled that she liked it, and then it was time to go. I learned that her grandparents wanted her all along, there was just some miscommunication, she’ll have cousins visiting frequently, and all the love I could wish for her. The rest of the day I felt totally at peace. I hugged my babies, watched my boy play and knew that she was ok.
I’ll likely miss her from time to time but I am so glad to get back to my own children. I have missed them fiercely.